This one just leaked, so I've only had one full listen-through and not much time to digest the record. I wanted to get this up as soon as possible, because it seems like the sort of thing that could get taken down fairly quickly. First off, I'll be honest and tell you all right off the bat that my write up is going to be biased as hell because I absolutely love this band. I was one of the few big supporters of their last album, A Hundred Miles Off (one of my favorites of 2006) and I can already tell after one listen that You & Me trumps it in almost every way. This record seems less scattered than their previous effort, and Hamilton Leithause's vocal delivery doesn't it make sound like he's coughing up blood between songs. Excuse my fanboy-ish hyperbole, but I would probably give up my man flower to Matt Barrick. The drums on this record are perfect, and are the glue that holds this album together. Again, i'll definitely have to give this several more listens, but I could see You & Me easily being one of my favorite records at the end of 2008.
thanks a lot! 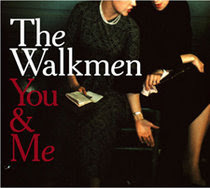 walkmen is one of my favs as well. listeng right now & i like the deep drumming in #1.. please keep on keeping on! You wouldn't happen to have "Pussycats" that Nilsson cover album the walkmen did? Its the only one I have yet to hear. www.daytrotter.com has an awesome session with The Walkmen, in which they do Leonard Cohen covers. Definitely, you should try Pussycats?